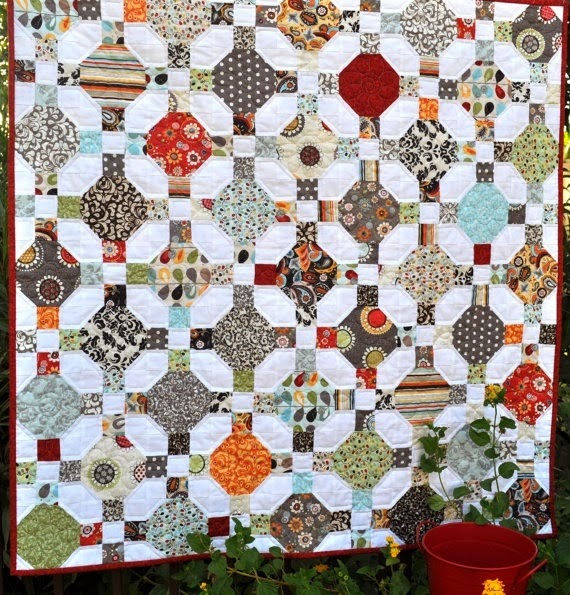 Magpie Quilts: Block of the Month - January 2014 - make that February 2014! Block of the Month - January 2014 - make that February 2014! Looking back over my blog stats for the past year, it seems that quilt tutorials are the easy winners for the posts that you like to read! So, I am going to attempt a Block of the Month (BOM) and hope I can make it straight through 12 months! If you're a beginning quilter, I am just going to concentrate on making blocks and the basic quilt top. If you want great instructions on quilt finishing, I recommend Joanne Middleton's Finishing Well DVD found here at Patchwork Schoolhouse! For January February, you are going to get two blocks! All blocks will be based on a 9-patch grid (3 squares by 3 squares) and are traditional blocks. You may know them by the names I use or by another name - traditional blocks are like that! The first is the basic 9-patch block. Normally, this block is seen with darker prints in the 4 corners and a dark in the center, but it looks completely different when you change the center to a light coloured fabric and the outside squares to all dark. And when you mix it up with a second block like the snowball block, the 9-patch blocks look different again! And there's no reason that your snowball blocks need a light center - try them with a dark center or mix and match dark and light to get a secondary pattern as I did here. Here's the 9-patch block alternating with a plain block. And here's the traditional 9-patch with snowball block. You can see how changing where the light and dark fabrics are changes the look of your quilt. And again, the 9-patch with a light center and dark all around with the snowball block. Instructions for 6" finished block (6.5" unfinished) are given with instructions for 12" finished (12.5" unfinished) block will be in brackets. These can be scrappy or coordinating, but keep in mind where you want your light and dark fabrics to end up. Lay them beside each other to make the pattern you want. Join three squares together to make a row. Sew three rows together to make a block. Press as you go, alternating directions on each row to eliminate bulky seams. Draw a diagonal line from corner to corner on the four smaller squares. Place one square right sides together on corner of larger square as shown. Press smaller square (now a triangle) toward corner. Repeat for other three corners. 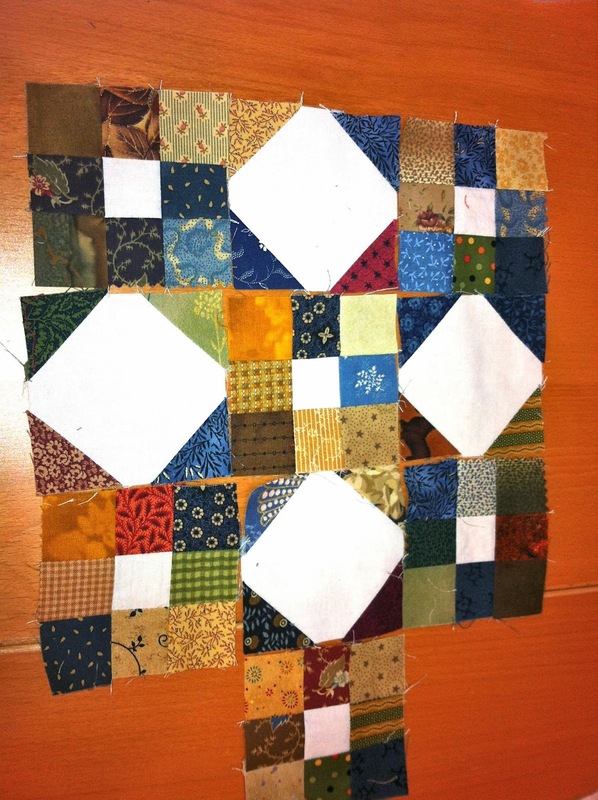 Make as many of these two blocks as you need for your quilt and lay them out in a pleasing pattern. Sew blocks into rows and then sew rows together. Add a border or two if desired. Layer with a batting and backing and quilt as desired! 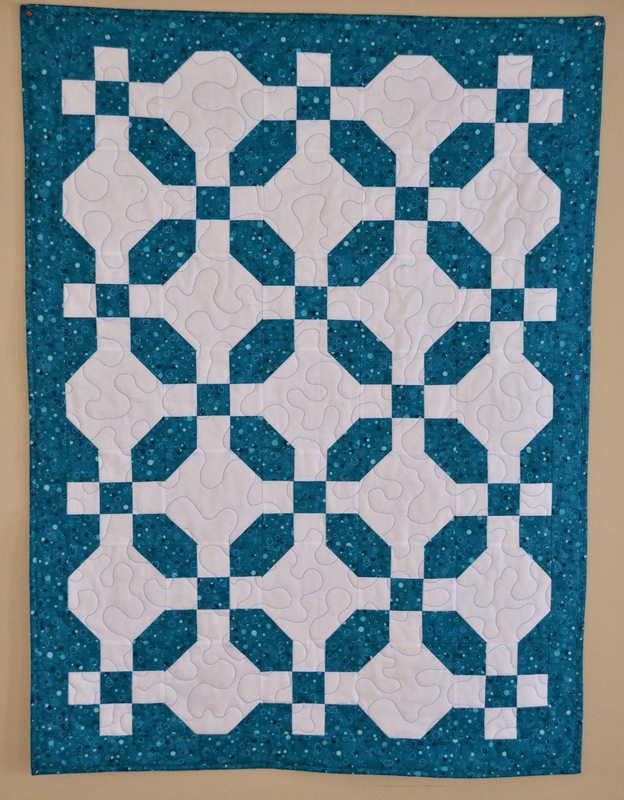 Hope you've enjoyed this fun little exploration of what a combination of two very simple quilt blocks can become! great block of the month, Ann. This was the first quilting class I took and first quilt that I completed. I like the idea of light and dark snowballs. Sure changes the look of the quilt.